Confession: I have an unhealthy obsession with afternoon tea. I love the tiny sandwiches, the scones with clotted cream, the perfect miniature desserts and, of course, the endless pots of tea. I really feel like I could have afternoon tea every single day. There’s something so satisfying about eating tiny food. It’s like tiny food gives you permission to eat as much as you want without worrying about whether or not you’ve consumed enough tea sandwiches to equal six real-sized ones. Speaking of real-sized sandwiches, not everyone is a fan of tiny tea food. My husband, Mike, wouldn’t exactly put afternoon tea high on his list of favourite things to do. Even though he doesn’t have anything against tea, sandwiches or desserts, he usually rolls his eyes in exasperation at my frequent requests to visit my favourite tea shop. He just doesn’t see the appeal. How could he not see the appeal? Tiny sandwiches and delicious hot liquids! What more does one need? Apparently boys really are different creatures and so for Valentine’s I decide to create slightly more appealing treat: afternoon beer. It took a while for me to figure out that afternoon tea isn’t really a guy thing, but now that I have, I think I’m really on to something. Afternoon beer was definitely a success. Standing in for the typical sweets on the first tier are chouquettes and churros. Usually Mike doesn’t touch the sweets when we do afternoon tea so I made sure that this tier had two desserts he actually likes. Who doesn’t love deep fried dough dipped in cinnamon-sugar and little sugar puffs? 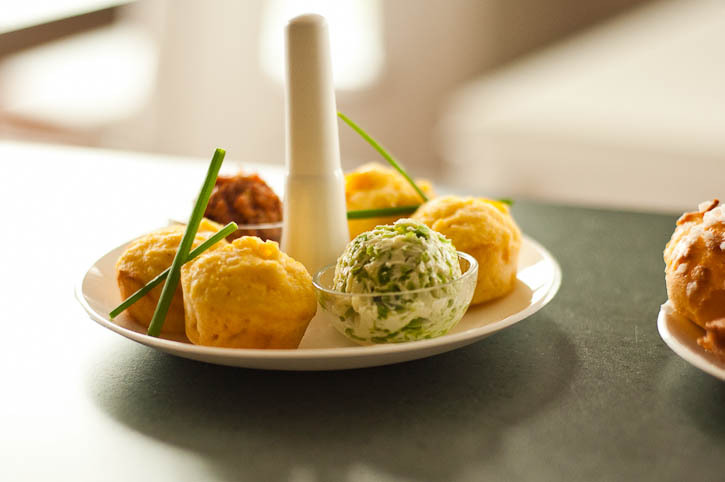 For the second tier, scones with clotted cream and jam were replaced by corn muffins with jalapeño butter and bacon jam. And for the bottom tier, instead of a variety of tea sandwiches: fennel pork sausage rolls, a simple mini burger, tiny twice baked potatoes and mini mac and cheese muffins. 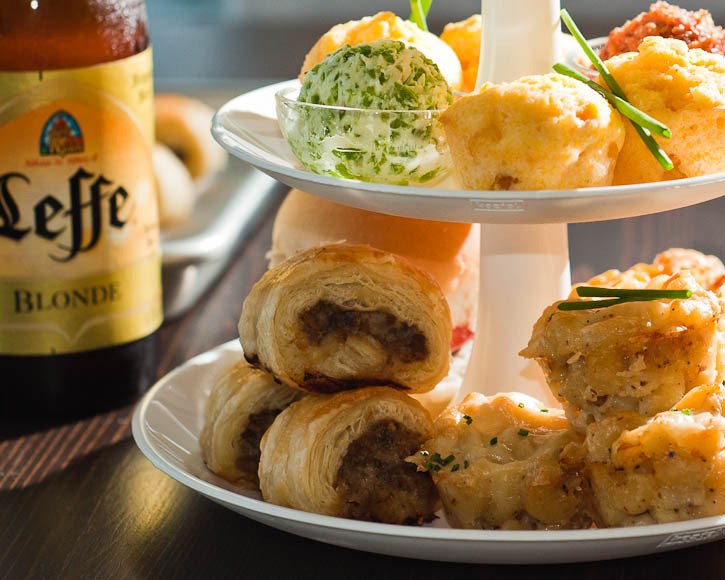 Ice cold beer and three tiers of man-approved beer snacks. I think this makes up for all those scones and clotted cream Mike’s been eating over the years. Afternoon beer might even be a new favourite in our house. I’ll be posting the recipes over the next couple of days. They make excellent snacks on their own, or if you feeling like a pick me up, afternoon beer is the way to go! This is genius. 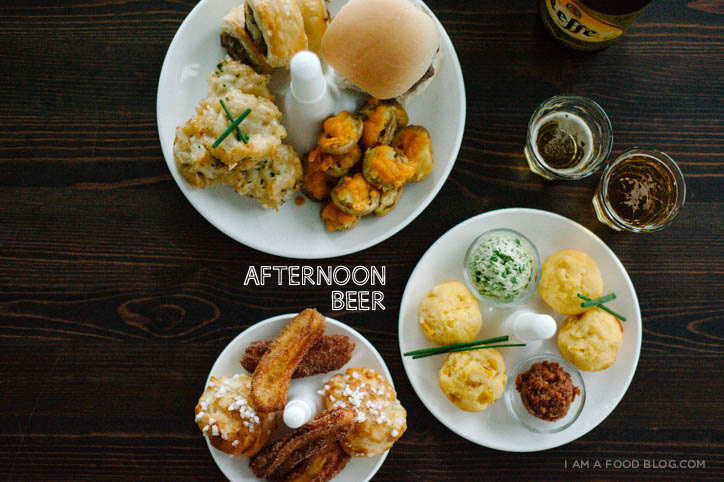 I’m a girl and afternoon beer definitely sounds way more appealing to me than afternoon tea. I may have to steal this idea! Absolutely a must try. My husband would be in heaven. This is quite possibly the best idea I’ve heard of in years. Kudos to you. Obsessed with your photography and interesting flavour combinations. You’re really making things hard for the rest of us plus-ones, Stephanie! Love, love, love. What a lovely and inspirational first article for an inspiring food blogger. Huge fan. I was looking around trying to get inspirations about starting my own food blog. Then I stumbled upon this award winning blog. Your page is absolutely stunning. 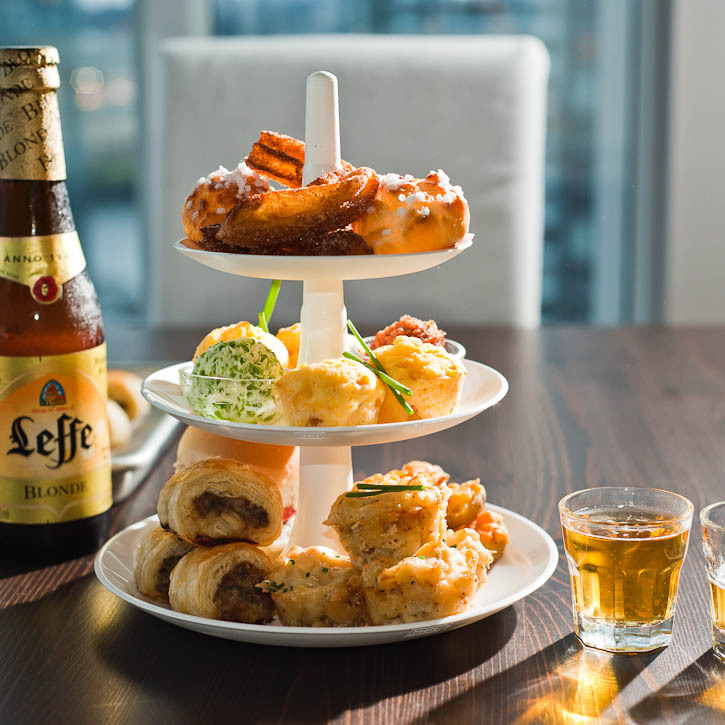 The moment I saw all that food and especially that bottle of Leffe I was sold. Thanks for doing what you do and keep it up! Absolutely awome idea. I love afternoon tea and all the girly fills that go with it. 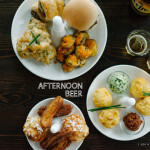 It would be great to come up with a way to combine tea with beer in the afternoon. I love this! I’m definitely going to adapt and try it out!